When it comes to having the soothing sights and sounds of babbling brooks and waterfalls in your backyard, you’ve got options. Assuming you’re looking for something more natural and integrated into your landscape than a fountain installation (though fountains work especially well in hardscape design), you have two major options. The first is the traditional pond, usually fed by a waterfall or brook, which can host whole ecosystems of plants and animals like fish. The second is less well known but could prove a better fit depending on your circumstances: the pondless water feature or pondless waterfall. What is a Pond and Pondless Water Feature? While water features come in many varieties, pond and pondless water features have the same two major components. First is a fountain, stream, or waterfall that feeds in and provides the sights and sounds. Second is where it feeds into. A pond is typically somewhere between 2 and 4 feet deep, depending on the ecosystem (such as koi or pond lilies). Pondless water features usually either have pools around 6 inches deep, or simply feed directly into the ground (and into the pump). Landscaping is about using the space you have to create something wonderful, and while there are many different kinds of water features, some have more requirements than others. Ponds need space. Not just space around, but space down. Since ponds require some major excavation, it’s important to figure out how it could fit into your space. If you’ve got a large footprint home and a small amount of exterior property (check out our blog, Landscaping in Small Spaces: Large Footprint Homes and Businesses for more info), you might find going pondless allows you to better use the limited space. What’s your overall budget? As we talk about in our design-build process blog, your landscape design and budget need to be on the same page. 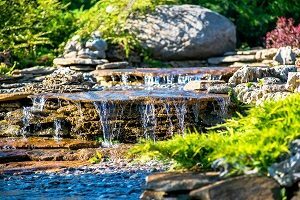 A pondless waterfall can be a beautiful addition to your landscape design that won’t take up as much of the time and resources as excavating an entire pond might. Like with all landscaping features, it’s important to prioritize your desires when talking to a landscaping contractor. Remember: you can always save a landscape feature installation for next year. Pump & Filter: One feature almost all landscaping water projects have in common is the use of a pump and filter. These need to be maintained and cleaned regularly to avoid breakdowns. Water: The water’s level of aeration, bacteria, algae, pH, and more need to be maintained, especially in ecosystem ponds containing plants and animals. Lining and Leaks: For ponds, pools, and streams, depending on how they are set up you need to be on the lookout for rips in the lining or leaks in the pump tubing. Keep an eye out for drops in pressure or lowering water levels. Fish: These animals are a great addition to any pond, but they need special care. Depending on the pond and type of fish, you will need to feed, manage pH levels, and care for your fish. This is especially true in winter if the pond freezes. Want help deciding and designing your perfect water feature? Contact the landscaping experts at Greener Horizon. We can help you design the perfect pond, fountains, waterfalls, and more!